One day while hitchhiking across the northwestern US as a young man, Junger sees a man approaching who he fears may be coming to rob him or ask for some of his minimal travel rations. Junger is then surprised (and ashamed) when the man unexpectedly offers him his own lunch. 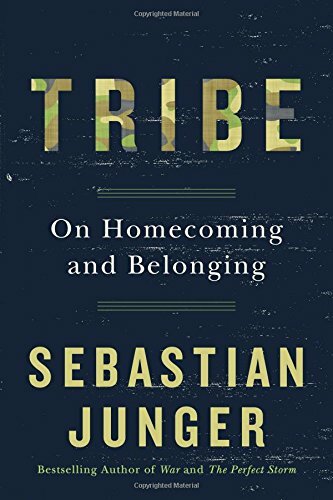 Junger writes that this unknown man treated him “like a member of his tribe”; in essence, “acting in a tribal way means being willing to make a substantive sacrifice for your community -- be that your neighborhood, your workplace, or your entire country.” He then spends the rest of his book exploring the rarity of this kind of act in modern society compared to tribal societies and societies in times of war or hardship, and what this means in respect to our individual and collective happiness and well-being. The entire book is rich with story and fact, and I highly recommend reading it in full (~150 pages). In this brief summary, I share the main points that continue to stick with me, and how lessons from Tribe apply to today’s job seekers. Charles Fritz, U.S. WWII strategist posits that existential threats to society erase the importance of class, income, race or other individual differences and create more opportunities for individuals to serve the group -- in turn helping people find a sense of value, connectedness and purpose. Examples include: crime rates dropping after Hurricane Katrina, lower psychiatric hospital admission rates and improved patient symptoms during WWII, asylum seekers re-entering war zones voluntarily. High modern soldier PTSD rates are in part due to the stark transition modern soldiers make from a group characterized by total belonging, shared resources and experience and a shared goal of serving the collective good, to the total opposite in modern society. The U.S. military has the highest reported PTSD rate in its history (21-29%) -- twice as high as the rate of British soldiers who were in combat with US soldiers, and significantly higher than groups like the the Israel Defense Forces with PTSD rates as low as 1%. Junger and the research he shares posit we need to focus on shared humanity, listening and uniting around commonalities instead of focusing on differences. 1. Cultivate and lean on your tribe. The most common words I hear from job seekers are “lonely, confused, overwhelmed, scared, stuck.” Even for the most qualified, today’s job search process has an uncanny way of turning what should be a quest to contribute our greatness into an isolated hunt for approval and acceptance. The happiest job seekers don’t hide in a corner waiting for their job search to be over. They connect with their network. They ask friends, family, and colleagues for guidance. They connect with other similar seekers to offer reassurance and solidarity and to remind each other that they are not alone and they will find their way forward. 2. Ask yourself how you can serve. If happiness in some part comes from connecting one’s individual and work purpose with the collective good, ask yourself what needs impacting society or your community might you want to do something about? What causes make your heart race or your blood boil, and how might you contribute to them on a full-time, part-time, freelance, or even volunteer basis? Doing so may lead you to your future career, help you build skills and your network in the direction of your dreams, or at the very least bring a greater sense of purpose and hence happiness to your everyday life. 3. Remember, it’s not just about work. If all we focus on is the next paid gig, we forget about our more important collective purpose -- to build a society where happiness and connectedness are accessible to all, a society worth living in and fighting for. What small changes can you make in your daily or annual habits to help make this happen? Every small change you make will certainly bring greater connectedness, happiness, and purpose to your life and the lives of others.